Thank you, Shai, for this great feature on Blogging Mamas at Weblogs.About.Com. It's wonderful to see DotMoms featured so prominently and to learn about why other moms read and write weblogs. 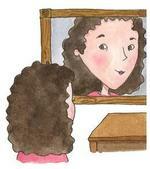 Mom in the Mirror: She's a mom who always ends her entries with a question for her reader and that makes it more interactive and fun. I love her parenting style -- the way she does things really reminds me of my mom, and as I've gotten older I've been able to see the wisdom in the way my mom raised me. So maybe my mom was right after all... hrm... and ... Colter's going to grow up and be grateful that he was lucky enough to have a mom who knew how to raise him right! Go ahead, brag: what's the nicest thing anyone's ever said about you? There's a thread on DotMoms about lying to your child. It reminds me of how difficult it is to determine (especially for kids) what to keep confidential and what to share. We were part of an incident last week that forced a discussion with Colter about this. One friend of Colter's casually revealed to him and another boy that a friend of theirs (who is 10 years old) wears diapers. My heart broke for the little girl, who was playing with them at the time. She was born prematurely, with some long-term developmental disabilities, most of which are not apparent to kids, so I wasn't surprised by the revelation but I was surprised by the reaction. She started crying and then asked to speak with her friend privately. She explained to her that she felt betrayed and, eventually, she forgave her. She was very poised and able to speak for herself. I also had a long talk with Colter about understanding and appreciating differences. We talked about his allergies, his ADHD, his Jewishness. And we talked about when to keep confidences and when to tell someone else something, especially an adult. I drew the line at information that could get someone hurt, emotionally or physically. Have you ever betrayed a confidence? Has your child? What happened? I'm usually a pretty organized person, but when I found myself maniacally cleaning out files yesterday and I considered my last few posts, I realized something must be really bothering me. It came to me quickly: Tuesday is Colter's birthday. Which means it would have been my dad's birthday. It will be the second since he died, the first I'm not sharing with my stepmother, who is preparing to move. Now that I know what's going on, somehow it isn't as emotionally overwhelming. Have you ever found yourself cleaning when you're upset? P.S. I posted the babysitter blues to DotMoms this morning. I learned at dinner that Colter was on a school bus yesterday for his field trip to a local hospital. This particular one had seat belts -- which is a mixed blessing -- but that did little to ease my anxiety. When we lived in North Carolina, I swore that my son would never ride one of those yellow monsters because it seemed they were involved in so many accidents, many of them severe. We've always driven him to school, and most of his field trips are taken in cars, with parents driving. Here in Florida, there are fewer accidents involving school buses, but I'm not sure I can dial down my fear. I worry about potential peer abuse -- Colter's ADHD makes him more likely to be the aggressor than the victim or otherwise have difficulty managing himself in an unstructured setting like this -- and I'm paranoid about the safety of these massive machines. Is it just me or are other parents afraid to put their kids on buses? p.s. I posted this morning to DotMoms: "Dr. Seuss may mean more to parents than to kids"
I was talking with a friend last week about ways in which I felt I was only adequate as a parent, and she suggested I make a list. So I did, and here it is. It's also posted as a comment to a similar item that was submitted to me yesterday for DotMoms. A good mother: feeds her child(ren) nutritionally balanced meals every day. A good (enough) mother: feeds her child chicken nuggets at least once a day if that's all he'll eat. A good mother: limits her child's exposure to electronics to an hour a day. A good (enough) mother: allows her child up to 2 hours of TV a day and longer on weekends if it means more time for her to read and write. A good mother: enrolls her child in piano lessons and makes sure he practices several times a week. A good (enough) mother: enrolls her child in piano lessons. A good mother: requires her child to hand-write thank you notes before playing with toys and gifts. A good (enough) mother: buys the pre-printed thank you notes, then sometimes sends them weeks late or forgets to send them at all. I asked Colter what makes someone a good mother, and he said if she: is nice to her kid, is good to her kid, is nice to her husband, likes the people she should (parents of kids Colter wants to play with). I asked Gary what makes someone a good mother and he said, "homemade fried chicken and chocolate brownie pudding" (his mother's specialties). I guess the trick is to transcend the superficial acts that make someone appear to be a good mother and focus on the deeper actions that help a child feel good about himself, his family and the world. Which are you: a good mother or a good (enough) mother?